For 14 years, a small fleet of Chicago & North Western E8 series of passenger locomotives served on the Chicago area commuter rail system now known as Metra. 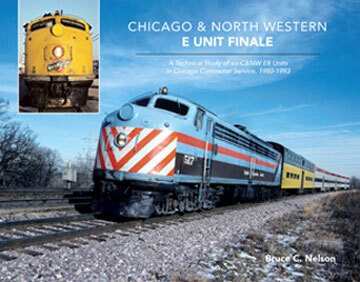 The author, who earlier wrote The 400 Club, has extensively researched how C&NW’s last E units were acquired by Metra and decorated in its image. Details are provided on the Es in regular Metra service, plus how some were temporarily assigned to East Coast commuter runs, railfan excursions and as lead units on Amtrak detours. Mechanical details and disposition of the fleet are also covered. The surviving E units are now owned by Union Pacific, several Midwest regionals and museums. Come learn the story of their Chicago commuter years! This title is a limited printing, so order early!